This is a good example with the preferred original 3 berth layout with forward heads and 3 good sea berths, all with lee cloths for security. Early viewing would be recommended as she is unlikely to stay on the market for very long. backstays. New cap shrouds fitted in 2017. Slab reefing main with lazy jacks. 2 X Coachroof mounted winches for staysail sheets. Shaft drive via conventional packing gland to 3 blade fixed propeller. 2 X Varta 75Ah batteries (2017 and 2014) charged by engine driven alternator. Approx 130litre S/S fuel tank situated under cockpit floor behind engine . 44 Litre flexible fresh water tank under cabin sole. This Vancouver 27 has the preferred original 3 berth layout with forward heads and 3 good sea berths, all with lee cloths for security. An additional pipe-cot has been added above the starboard saloon berth to give a useful 4th berth. Lavac Sea Toilet on the centerline. Basin to port with pumped fresh water, Hanging locker to starboard. Central saloon table with drop leafs. Two good sea settee berths each side with stowage lockers behind. Provision for an additional pipe-cot above starboard settee berth. Quarterberth to starboard with easily accessed top-loading cool box under. Galley area to port with inset S/S sink and drainer unit. Pumped fresh water and sea water supplies. Plastimo Neptine 2000 cooker with 2 burners, grill and oven. Gas safety certificate 2017. Stowage lockers for crockery and pans. Hasler Wind Vane self-steering system with trim tab. 15Kg Bruce anchor with approx 30m of marked chain. Seago 4-man liferaft serviced to 2020. Auto fire extinguisher in engine compartment. Manual fire extinguishers for’d and aft. standard by Pheon Yachts of Newhaven. equipped. 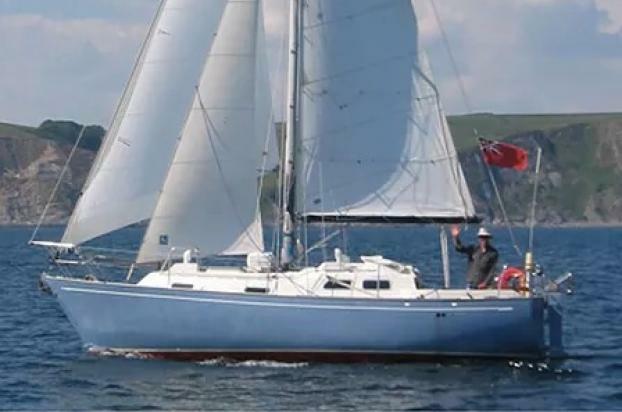 These fantastic long keel boats were designed by Robert B Harris as robust blue water cruisers for couples. With a strong pedigree, they are sturdy, safe boats which can go anywhere in the world.